Multi-Geo capabilities in OneDrive and SharePoint Online enables control of the country or region where shared resources like SharePoint team sites and Office 365 Group mailboxes are stored at rest. 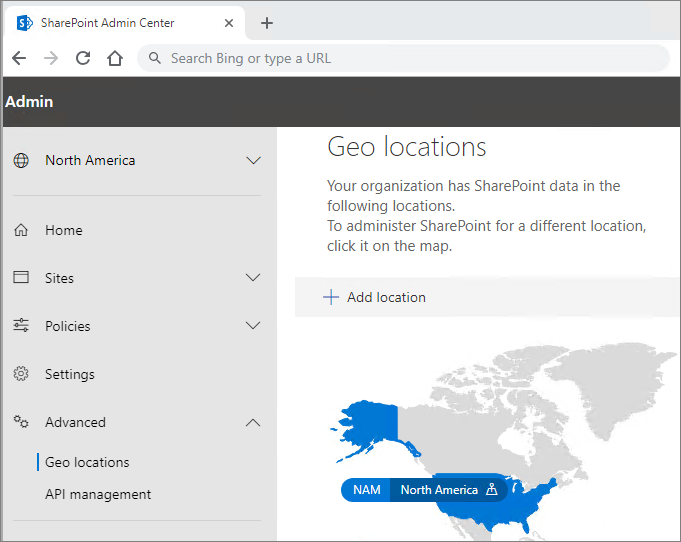 Each user, Group mailbox, and SharePoint site has a Preferred Data Location (PDL) which denotes the geo location where related data is to be stored. Users' personal data (Exchange mailbox and OneDrive) along with any Office 365 Groups or SharePoint sites that they create can be stored in the specified geo location to meet data residency requirements. You can specify different administrators for each geo location. Users get a seamless experience when using Office 365 services, including Office applications, OneDrive, and Search. See User experience in a multi-geo environment for details. Each user's OneDrive can be provisioned in or moved by an administrator to a satellite location in accordance with the user's PDL. Personal files are then kept in that geo location, though they can be shared with users in other geo locations. Office 365 services other than Exchange, OneDrive, and SharePoint are not Multi-Geo. However, Office 365 Groups that are created by these services will be stamped with the PDL of the creator and their Exchange Group mailbox and SharePoint O365 Group Site provisioned in the corresponding geo. Setting up and managing your multi-geo environment is done through the SharePoint admin center.